Finding new products that goes well with my expectations or finding new products that really suits me and gives me benefits are such a very nice experience for me. I love trying on different products and if I find something great I'll stick to it. Now let's review them a bit, shall we? I have been using this product for about 2 years now. This is one of the few products that I have in stocks on my drawer ;p I don't know where to get this in Indonesia because Tresemme products is still rare here in Indonesia except for their shampoos and conditioners range. I hope Tresemme will bring many other variants of their products here because I know they have lots of great hair products, such as this one. This is a heat tamer spray that minimizes heat damage that you might get from your hair dryer and other hair styling tools. I think it's important to keep your hair from heat damage. This protects my hair, keep the friction away, and it also keeps my hair manageable. This also helps my wet hair to dry a little bit faster. I also love the nozzle shape that comes with a sort of detachable lock/stopper, so it's good for traveling too. This is also another favorite hair product of mine but this is from a newer purchase. I bought it as a set of three at Watsons. I fell in love with it right after I used it for the first time. This is a hair repair cream with Phytantriol, Vitamin B5, and pure vegetable protein. You can use this as daily conditioner or as a weekly hair mask. From the first time I used this I felt a difference in my hair, it is softer and it stays soft for days. My hair also feels very light and a little bouncy. Love this and will keep on using this in the future. I'm glad I got the set which comes with 3 tubes of this goodness. OH-MY-GOD this is THE BEST toner that I have ever tried in my whole life! This is THE B.O.M.B! I love it since the first time I've tried it. I found this at Strawberrynet because I coulnd't find it in L'Occitane counters here. I've read about how good this toner is in a beauty forum and decided to try it by buying the travel size. Lo and behold, I fell in love with it instantly. This toner is so perfect for those with oily or combination-oily skin. There's a little ball inside it that I think helps with the shaking process (you have to shake it before using it), so it's pretty unique. This totally cleans everything: oil, dirt, and every trace of makeup. If I only wear light makeup I can just use this for cleansing my whole face and all the makeup would be lifted by the power of this amazing toner. I will definitely buy a full size bottle once I ran out of this one. UPDATE: Sadly this turns out to be a discontinued product from L'Occitane. Boohoo... So if you want to try this you might try websites such as strawberrynet or maybe even eBay. This is a new found love for me. I was in need of a new concealer which can conceal my dark eye bags and I've read some nice reviews about this one. After trying it several times I am definitely hooked. This can cover my eye bag naturally as well as lighten the darkness that lingers underneath my eyes. There are several variants of this NYX concealer and I chose the yellow one which is great to counter the dark eye bags. This concealer is very light and has simply works for me, it's better than the rest of my under-eye concealers. 'Nuff said. I have just reviewed this a couple of days ago and as I said in that post this mascara is one of the blackest mascara I've ever used (and I have tried lots of mascaras, trust me). This also curls my lashes and it does stay on my lashes for the longest time. I also love the 2-in-1 concept of this mascara that comes with the popular Talika Lipocils which is an eyelash growth treatment. It's really practical and very ideal for traveling. You can read my full review about this amazing product HERE. This is my first ever NYX jumbo eye pencil and I have loved it ever since. I intentionally chose the color Milk which is a white color because I've read on beauty forums and other blogs how this Milk jumbo eye pencil can act as a great base for eyeshadow colors. So you put this on your eyelids before you put on your eye shadows. This has help my eye shadow from creasing too much and it also help it lasts a little bit longer on my oily eyelid. This is also great as a color base because this brings out my eye shadow color to a more intense color. I always have a problem with pastel colors because it usually won't show on my lids, but with this as a base I can finally show some pastel colors on my eyelids. Love it. I love using lip liners because it keeps my lipstick lasts a little longer and it also helps makes my lips seems a little bit fuller. This Bobbi Brown lip liner is probably the best of the rest of my lip liner collections because this has the best texture which is not too creamy that it melts right away nor is it too stiff that makes it a little bit hard to use. The texture of this lip liner is between hard and soft, it's hard to explain, but it's just perfect. I also love the color which translates into a deep rose color on my lips, which is perfect because it matches a lot of my lipstick colors. That's it for my February Favorites. What are your current favorites? If you want to check out my previous January Favorites, you can read it here. Thank you for the recommendation of cosmetics,its very useful. Moreover the product is used by yourself, so much more explanation that i can get. Thank you and i really expect more on other cosmetics that i had everknow. 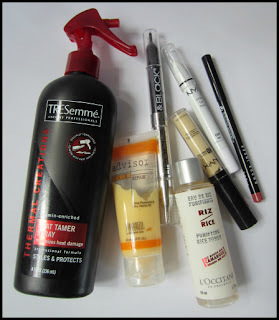 where can i buy the Tresemme thermal heat spray in indonesia? Nice beauty products! :) Maybe we could follow each other on Bloglovin and/or GFC?